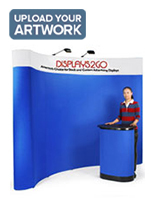 This tradeshow display, also known as a pop up booth, offers a great way to get a tailored look at a low cost. 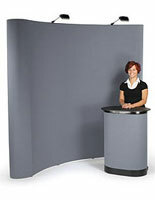 Exhibitors typically use this fabric panel fixture as a backdrop to exhibit promotional signage and other accessories. 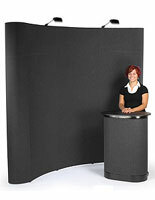 This tradeshow display is 10' wide and covered in black fabric that is receptive to hook and loop fasteners. This allows users to add any combination of accessories, like brochure holders, magazine pockets and sign frames that fit your needs. 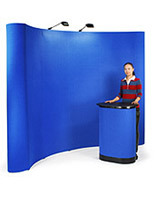 Designed especially for use at tradeshows, conventions, and exhibitions, this tradeshow display is portable and easy to assemble. Just raise the lightweight frame from the ground and magnetic connectors will automatically snap the pieces into place. The tradeshow display features fabric panels that attach to the magnetic channel bars along the frame for a clean, seamless look that will complement any booth exhibit system. 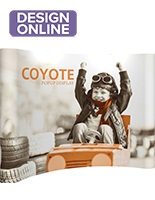 There are many accessories included with this popup stand at no extra cost. 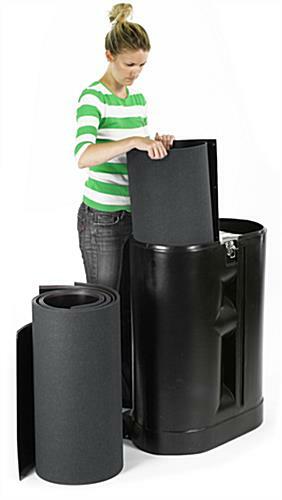 This tradeshow display features a molded, hard plastic carrying case that features built-in casters and safety latches. This deluxe travel case converts into a highly functional exhibit counter that can be used to address an audience, display literature, or demonstrate products. 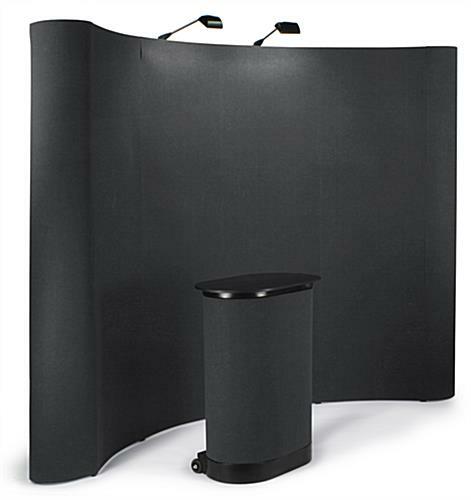 As an added bonus, this tradeshow display also features a matching black wrap-around fabric panel and laminate countertop as part of the conversion kit. The fabric panel is made out of hook and loop receptive material to match the popup backwall and give your booth a unified look. 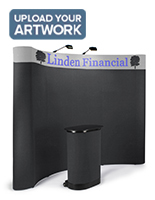 We offer this tradeshow display with two halogen spotlights that attach to the frame and increase exposure to your booth. 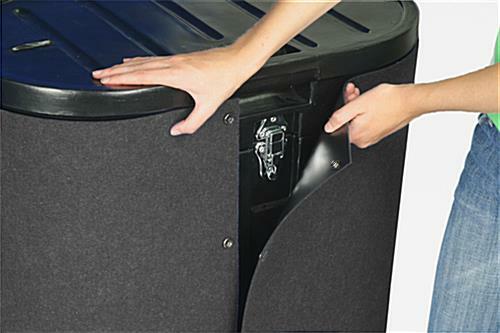 A foam-padded storage compartment in the case keeps the lighting safe from damage during transportation and storage. This tradeshow display is an appropriate option for novice exhibitors that don't have a big budget for custom printed graphics. 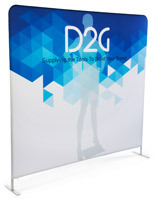 120.0" x 91.0" x 37.0"
29.0" x 37.5" x 17.0"
Wanna draw attention to your brand! This is a much more professional looking design than what we expected! Super easy to assemble! The customer service was great also! We're so happy to hear that you've had such a nice overall experience shopping with us, Lyle! We agree, your set up looks sharp! Thanks for the great review and for sending us this great shot of your set up in action! 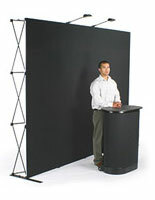 I have been using various hook and loop backdrops over the past 20 years, and this unit is so much easier to assemble. I would highly recommend it for an exhibit that would have changing pieces. My only wish: there were back panels for the exhibit. We did have a request to use the backside curve, but can't due to them not being available at this time. Thank you for the thoughtful feedback, Garo! We appreciate the time you took to send us your thoughts and hope we can work together again soon! Very happy with the display system, which I purchased for our client to use at a trade show. The client is pleased too.